Yes, those are sausages - 3 kinds to be exact, hungarian, kielbasa and chorizo then bacon, garlic potatoes and herbs. Once the manong hacked the lechon open, the aroma of the sausages, herbs and lechon filled the room. It was glorious - glorious because I closed my eyes and let the scent fill me and my imagination. It was wonderful. Imagine, the aroma of sausages add to that the aroma of herbs and the garlic potatoes and mix it with the delicious scent of roasted lechon skin. 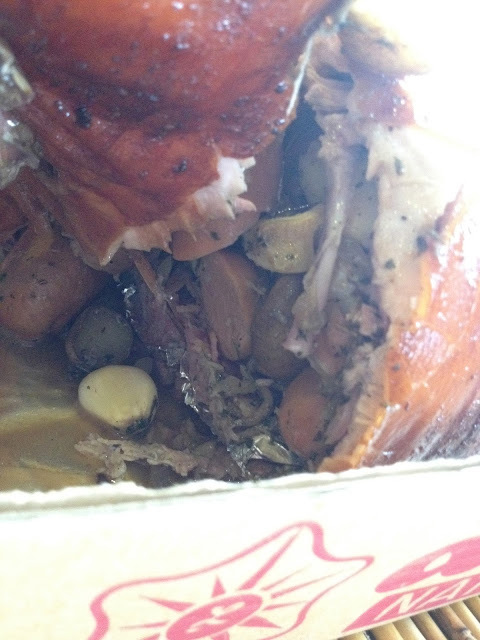 Here's another look at the lechon cross-section. 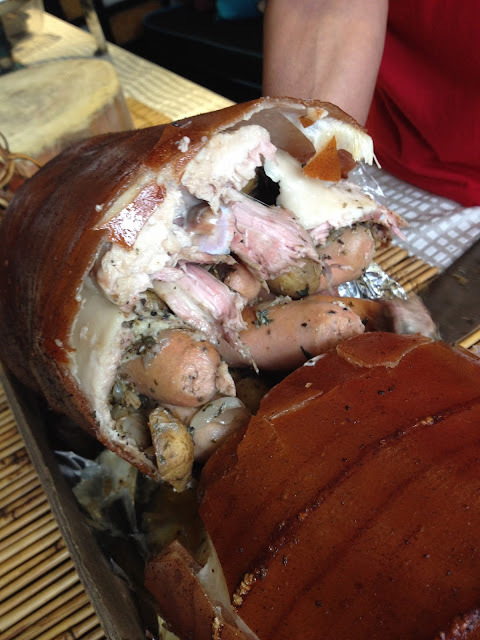 I swear to you, you will NOT look at lechon the same way again, after seeing and tasting this. 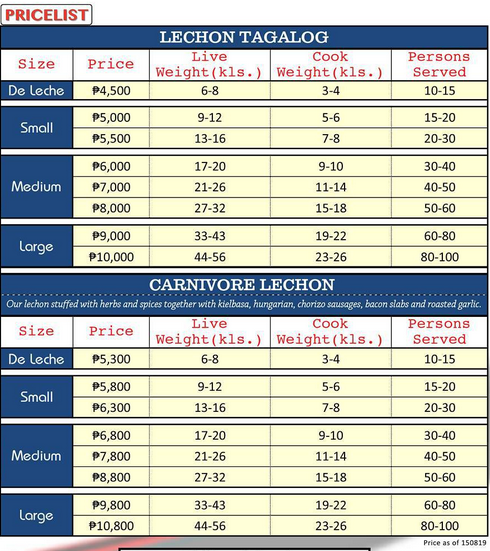 I don't think I will want to eat the normal kind of lechon or a different kind of lechon. THIS LECHON IS IT. I confess that I am not fond of lechon and the only thing I eat of lechon is the skin - but this Carnivore Lechon - it made me want to try to eat the meat. And it was juicy, it was flavorful, it was soft. One reason why I don't eat lechon meat is that I often times find the mean tasting *malangsa*. I can't explain it - but this particular lechon had no trace of being *malangsa*. The meat was flavorful, soft, juicy - all the meat stuffings (3 kinds of sausages and bacon) was perefectly packed and seasoned. I believe it was what flavored the lechon in the inside. The garlic potatoes were very good too! I super loved seeing big pieces of garlic! Hahaha.. Garlic is my weakness! 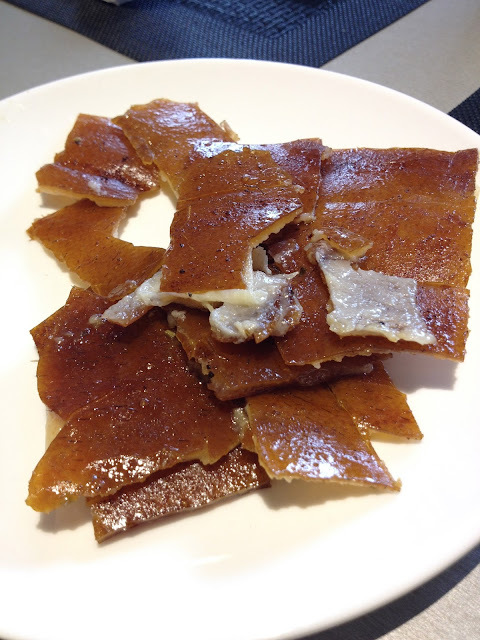 These were the lechon skin that Rowena and I ate like potato chips. Hahaha!! 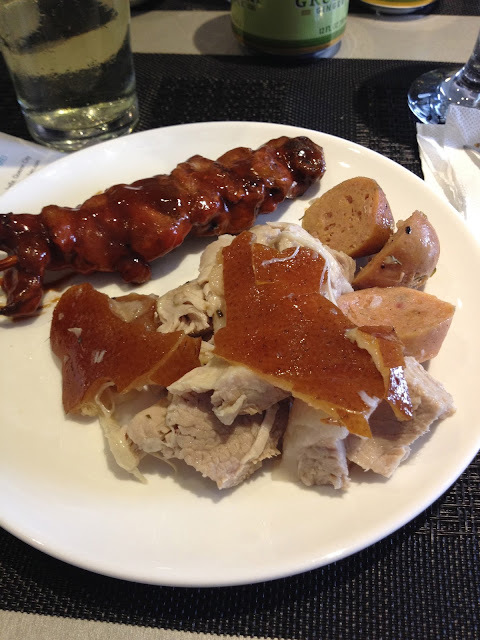 Look at my plate of Carnivore Lechon. 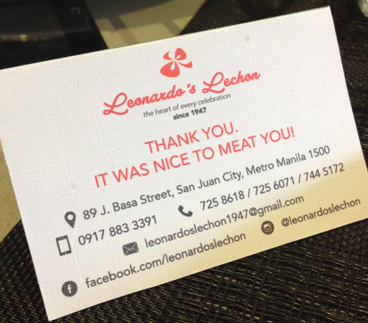 Leonardo's Lechon has been around since 1947. It's an institution in San Juan! 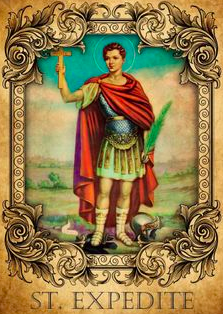 I remember seeing it everyday along Blumentritt Street in San Juan when I was younger. That was my route going to school and I often wondered what it tasted like. I remember during one of the first Ultimate Taste Tests of Anton Diaz, Leonardo's Lechon was part of it. They have a rich history and I admire that they support the community livelihood in Pangasinan. Leonard mentioned that all their pigs come from Pangasisnan they support the communities there and give back. 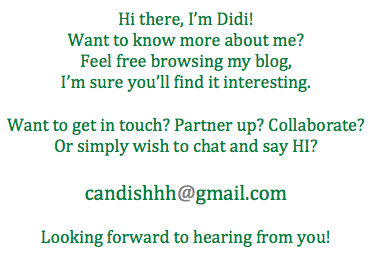 It's nice that they practice social responsibility. I admire companies that values social responsibility. And I think that is why they're still a front runner in the industry. They also don't freeze their pigs or kill the pigs ahead for orders. They kill it fresh, and example was when clients need their Lechon at 4PM, Leonardo's kill the pigs at 10am. They don't practice freezing pigs ahead of time because it affects the taste. I agree - it would taste really different. They have a small piggery in San Juan where they keep pigs on back-up. When you order lechon, it automatically comes with free dinuguan. This Leonard says, is because they want clients to get the whole lechon (innards included) so you can say that you really got everything in the pig. They offer free delivery in certain areas. The world is truly very small, why? Well, the one who invited us - Leonard, Nard to me; is a friend. Well, I met him years ago in High School - we belonged to the same batch, he was from Xavier and I was from ICA. And you know what else? Well, Nard and my brother in law Gilbert are Triathlon teammates! My brother in law has been telling us to order from Nard. 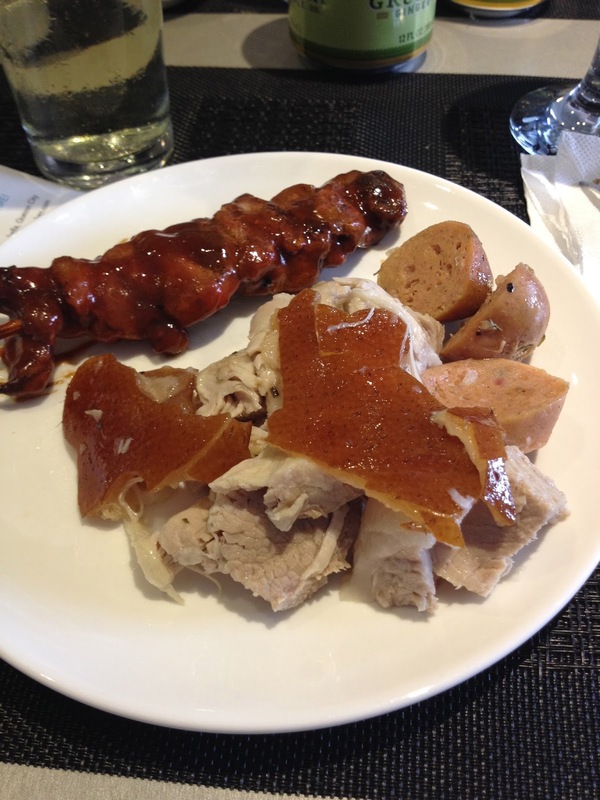 Well, now I know what to order for our next family dinner - and that's the Carnivore Lechon. Thank you Leonardo's Lechon for coming up with this kind of lechon. You set the bar high for me, and I declare it - the BEST lechon in my book. We even had take home lechon. I shared it with my brother (who is also friends with Nard) and my mom, they finished it instantly. Hahaha!! It was that good. Thank you Gerry for thinking of me. It was indeed good food, good times! Thank you Nard, Erica and Mary Ann! !